For the last 60 years or so the Tate has always had a selection of works by William Blake from its collection on display. There has never been any doubt during this period that Blake’s unique achievement should be represented within the context of British art as a whole and that the Tate, as the National Gallery of British Art, was the place where this was best done. This still remains the Tate’s view. It has been done, moreover, in a way not possible for other public collections in the UK which hold Blakes: in the form of a display, on the walls, permanently accessible to the everyday gallery goer. It is the Tate’s intention that this should continue to be the case. Achieving this successfully, particularly with the light-sensitive works on paper which make up the bulk of the artist’s output, has been a matter of some pride—to the extent that the Tate has had two rather special “Blake Rooms”: the first, the present Gallery 2 which, following the accessioning of 70 works from 1918-1922, was decorated in 1923 with a mosaic floor (still in situ) by Boris Anrep illustrating Blake’s “Proverbs.” The second is a very different room, which was inserted into one of the Tate’s conventional top-lit daylit galleries. This gallery, which opened in 1978, for the first time provided the correct controlled levels of temperature, humidity, and light required to ensure that Blake’s work, while being on more or less permanent display, did not deteriorate. 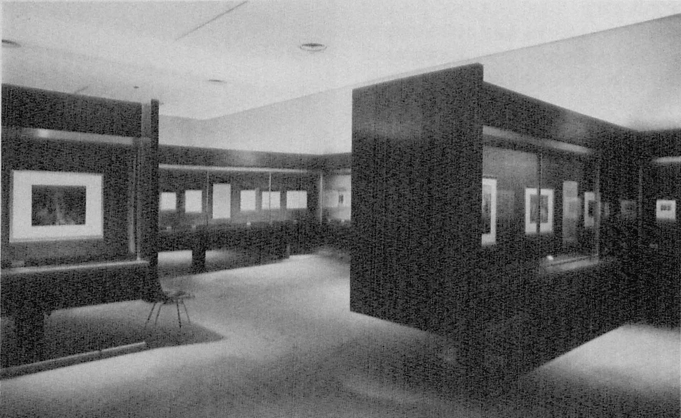 This “Blake Room,” which was undoubtedly familiar to readers of Blake, finally closed in November 1989. This latest move arises from our present task of redisplaying the entire Tate collection to make the best of our limited gallery space. Our first requirement, and the most pressing, was the need to rehang all the main galleries in the Tate—an idea put forward by the Director and accepted by the Trustees in principle at the end of 1988. Over the last decade a number of exercises were done, on paper, with just this end in view. What usually emerged from these exercises was the conclusion that any attempt at rearranging the chronological sequence of Historic British paintings into galleries would be thwarted by the presence of the Blake Room. No rearrangement ever quite succeeded in demonstrating that the works of Blake could both remain in their specially designed gallery and still be near or adjacent to works by the artist’s contemporaries. The other issue of immediate concern was that the airconditioning plant for the Blake Room had reached its end and was due to be replaced during 1990 (at which time the Blakes would have to be unhung). In the knowledge that no thoroughgoing reshuffle of the British Collection and Modern Collection could work if the Blakes were to remain where they were, it seemed neither sensible nor realistic to renew this plant when the effect of doing so would be to perpetuate a situation which restricted our room for maneuver. The upshot is that the group of works by Blake and his followers are now housed in the smaller, un-airconditioned Gallery 12, adjacent to the room in which they were displayed during the mid-1970s. In adjacent rooms will be works by, for example, Fuseli, De Loutherbourg, Stothard, John Martin, and John Linnell. The most obvious change brought about by this new arrangement will be—now that they are shown in a smaller room—fewer works by Blake begin page 212 | ↑ back to top and his followers on view at any one time. There will be other changes too. Instead of being displayed in wall mounted vitrines, most pictures will be more conventionally shown in their frames and glazed with low reflecting glass, while others will be set out in traditional floorstanding showcases. The low levels of artificial light which were maintained in the old Blake Room will be duplicated for the new display. As in the old Blake Room, the emphasis will be on providing the sort of serene environment appropriate for the contemplation of Blake’s work. In line with the policy we are adopting for other galleries, a descriptive wall text will give some basic information about Blake and his art, and selected works will have descriptive labels which, it is hoped, will help visitors to appreciate high points of the display they might otherwise miss. The reduction in the size of the Blake display is, in fact, counterbalanced by a number of other features which should ensure that, in line with a well established precedent, the Tate’s Blakes still reach a wide audience. The first is that the displays will be changed every six or eight months. The first of these changes will occur in July 1990 when 11 works will be removed from public display to be loaned to the Blake exhibition in Tokyo; they will be replaced by other works from the permanent collection. Secondly, those works which are not on display in the Gallery will generally be available for viewing in the Tate’s Study Room (open Tuesdays through Saturdays, 12 noon to 5 p.m.). For conservation reasons and because we still regard them as works primarily intended for gallery viewing, these pictures will mostly remain framed and glazed, but they will be available on request to visitors and can be seen under conditions equal to or perhaps (for some people) better than those in the gallery. 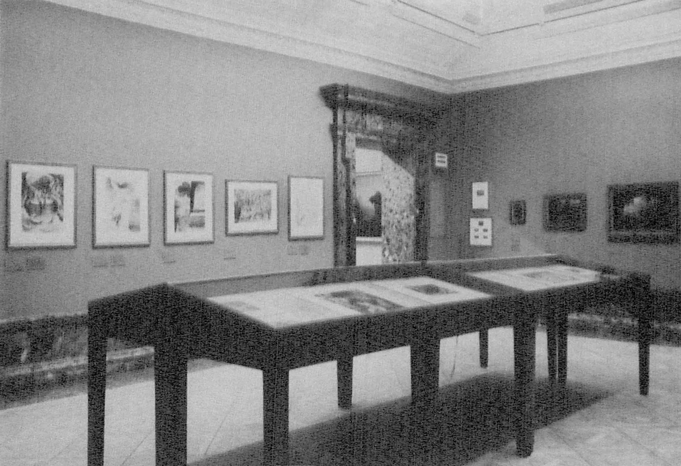 The Blake Room at the Tate Gallery 1978-1989. The Blake Room at the Tate Gallery, January 1990.
hope not only to capitalize on the Tate’s importance as a center for Blake studies, but also, just as importantly, to attract as wide as possible an audience for the pictures of an artist who is one of the major figures in British art, but who is probably not as widely appreciated as he deserves to be. There is a firm commitment on the part of the Tate Gallery to maintaining begin page 213 | ↑ back to top its unique record of having Blake’s work permanently on display, as well as a continuing commitment to adding to the permanent collection of his works as and when appropriate. Our recent acquisition of “A Vision” (illus.) is, perhaps, sufficient proof of our intentions. William Blake, A Vision: The Inspiration of the Poet, c. 1819-20. Water color over pencil 171mm × 178mm (6 3/4 in. × 7 in.) on wove paper 244mm × 210mm (9 9/16 in. × 8 1/4 in.). Inscribed in ink by Frederick Tatham, “William Blake. / I suppose it to be a Vision / Frederick Tatham” and “Indeed I remember a / conversation with Mrs. Blake / about it” bottom right. 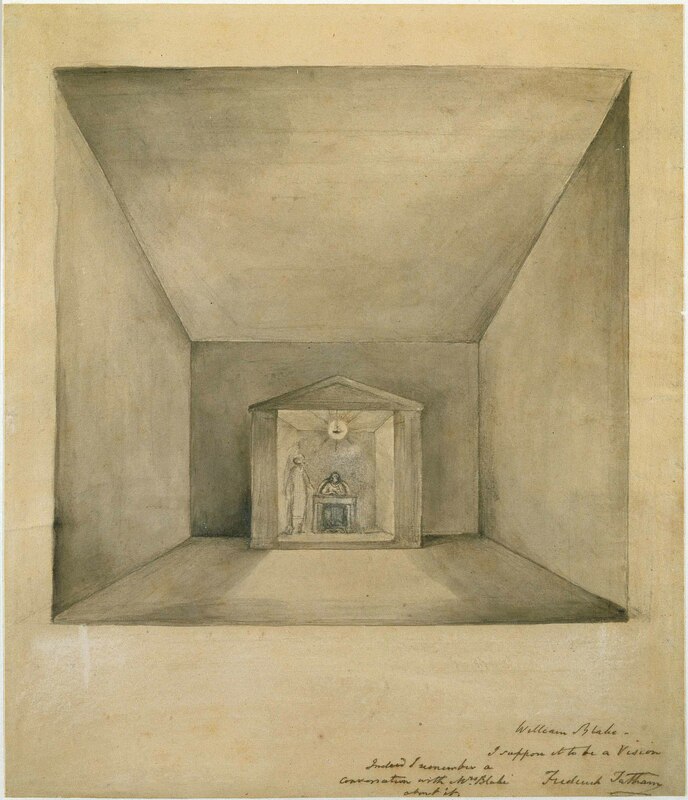 This work, number 756 in Martin Butlin’s 1981 catalogue, The Paintings and Drawings of William Blake, was acquired from David C. Preston by the Tate Gallery at the end of 1989. Its purchase was made possible through the generosity of Edwin Cohen and the General Atlantic Partner’s Foundation. Full details of the work are to be found in the new catalogue of the Tate’s Blake collection, by Martin Butlin, published in March 1990. This catalogue will also be available through the Tate’s U.S. distributors, the University of Washington Press, beginning in summer 1990. Our long term aim is to establish a larger, permanent display under the ideal conditions which the present Tate cannot provide. Our ideas for this are incorporated in our plans for future building works, and we anticipate seeking private funding for this project at the right moment.